Do you want to get rid of whatever fear is holding you back? Are you wondering if there’s a different way to do things? Change your thinking! Change the way that you do things! Neuro-linguistic programming (NLP) is a multidimensional process that involves strategic thinking and an understanding of the mental and cognitive processes behind behaviour. The name NLP represents how the brain and body interact through language. Put simply, NLP is a user’s manual for the brain. NLP was developed by John Grinder (whose background was in linguistics) and Richard Bandler (whose background was in mathematics and gestalt therapy) for the purpose of making explicit models of human excellence. NLP has developed some very powerful tools and skills for communication and change in a wide range of professional areas including education, creativity, management, leadership and counselling. 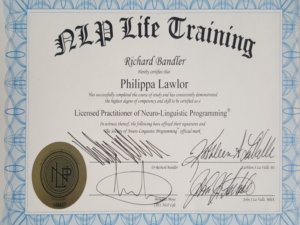 Pippa Lawlor trained with Richard Bandler, John and Kathleen La Valle and is a Licensed Practitioner of NLP. Recognising that everyone has individual needs, Pippa offers personalised face-to-face NLP client sessions at a time and place to suit you. Please e-mail or call 021 0244 3625 .